The 56th Venice Biennale has officially started, and the feeds of social media are already flooded with images from the event. One of the pavilions that attracts my interest so far, is the one created by SIMON DENNY for New Zealand. The title of the project, Secret Power, refers to a 1996 book by NICKY HAGER, an investigative journalist from New Zealand, who is currently working to disseminate many of the leaks made by EDWARD SNOWDEN that implicate New Zealand in having collaborated with the US government in its spying activities. This exhibition is split across two sites: the first venue is in the terminal area of Venice Marco Polo Airport and the second is taking place in Venice’s Marciana Library, the home of a great collection of original Renaissance maps that have been key to the development of the exhibition as well as the ‘clandestine visual world’ leaked by SNOWDEN and designed by DAVID DARCHICOURT. 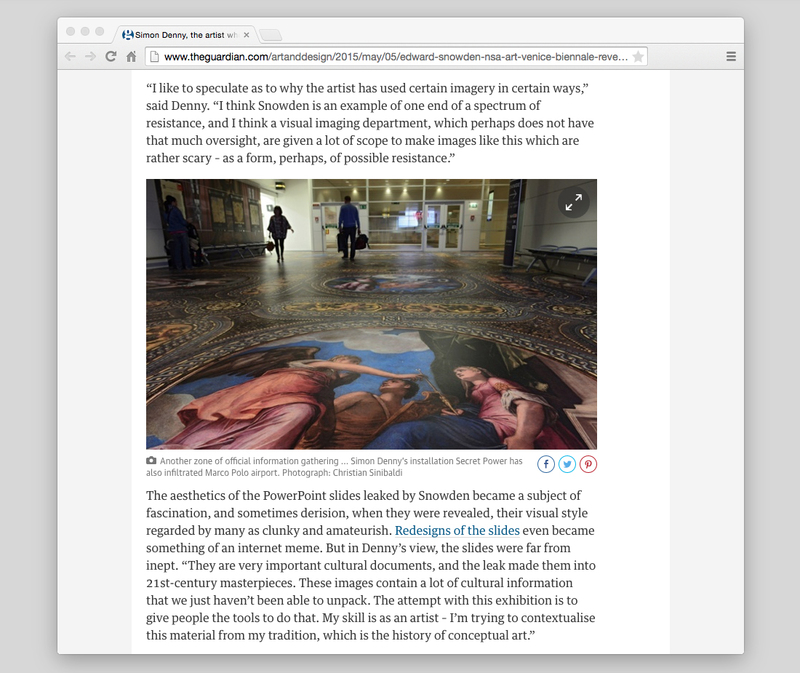 The article written by CHARLOTTE HIGGINS for The Guardian (excerpt above) explains very well the complex, yet fascinating puzzle behind DENNY‘S Biennale project, make sure to read the whole story via http://www.theguardian.com/artanddesign/2015/may/05/edward-snowden-nsa-art-venice-biennale-reverse-espionage and to visit the New Zealand’s pavilion website http://www.nzatvenice.com/#2015-project. ➝ The Biennale’s exhibitions will be open to the public from Saturday, May 9th until November 22nd, 2015 at the Giardini and the Arsenale venues in Venice. Please note also that The Innovator’s Dilemma – the largest US museum solo exhibition of SIMON DENNY’s work to date – is on view at MoMA PS1 till 7 September 2015.